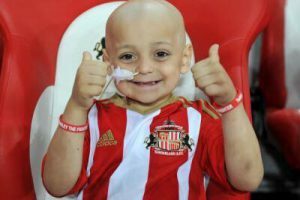 The Bradley Lowery Foundation has been set up in memory of my son. Bradley gained his angel wings on 7 July 2017, 1.35pm, at the age of 6 after a 4.5 year battle with Neuroblastoma. Whilst Bradley was suffering himself. Bradley used to always look out for other children on the ward, this inspired me to carry on his work now he is no longer with us. Our aim with the foundation is to help and support campaigns to raise funds for medical treatment/equipment not available on the NHS. I tried everything within my power to try and help Bradley survive, but unfortunately it never worked. I want to try and help other children achieve the goal we didn’t. Bradley has created a legacy that we are so proud of, Myself, my family and my team want to carry on his legacy and do my little boy proud.